that means feeling sick. Luckily, there are many home remedies for opiate withdrawal that can help alleviate your symptoms and help you quit opiates for good. All of these remedies have been tested by others and are generally much safer than opiates, but keep in mind that I am not a doctor and you should always talk to one before you start taking anything! Also, I am adding a link to each remedy that will take you to a more detailed guide on how to use it, along with dosing amounts and frequency. If one remedy looks appealing to you, click on the link and you can find more information about that particular solution. 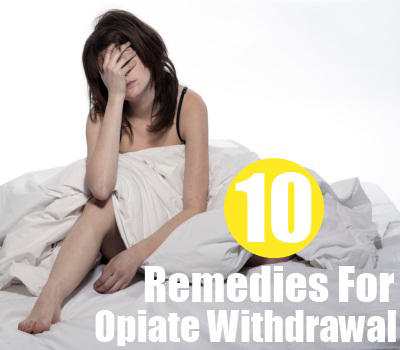 With that being said, here are some of the most popular opiate withdrawal remedies. Kratom – Kratom is a plant that reacts on your brain very similarly to opiates. Although it’s not technically an opiate by physical structure, it still acts on the same receptors and therefore can be a powerful solution for withdrawal. Kratom typically comes in a capsule that you can swallow or a plant material that you can use to make tea with. Read my full write up on kratom for opiate withdrawal. Gabapentin – This is a prescription pill with the brand name of Neurontin. It’s typically used to treat nerve pain or bipolar disorder. For whatever reason, it can help a lot with opiate withdrawl and is a popular “comfort med” given by rehabs and detoxes to their opiate patients. You’ll need a prescription from a doctor, but it is well worth it if you can get it. Read more about gabapentin for opiate withdrawal. Clonidine – Even though this is a blood pressure medication, it helps a lot with the symptoms of opiate withdrawal. It can be used up to 4 times a day, but be careful that your blood pressure stays normal, as this can quickly lower your normal pressure and make it hard to get out of bed. I highly recommend using this in conjunction with gabapentin, and a mild benzo. Read more about clonidine for opiate withdrawal over here. Tramadol – Tramadol is actually a very mild opiate that a lot of doctors give to people with pain. It’s not as powerful as percocet or vicodin, so it can be used to take the edge off of your opiate withdrawals in the first few days. Because it is an opiate, you must use caution with this medication as it can prolong withdrawal further. Read more about tramadol for opiate withdrawal here. Loperamide / Imodium – This is a new method that involves using anti-diarrhea medication to ease withdrawals. A little known fact is that loperamide can react to the opiate receptors in the brain, making it a perfect over the counter solution. Be extremely careful with this, as there are many stories on the internet about loperamide addiction. It sounds crazy, but I’ve dealt with it myself and I can say it’s just as bad as heroin withdrawal. Read my guide to using loperamide for opiate withdrawal here. Xanax – Using xanax or any other benzo for opiate withdrawal can help drastically with sleep and restlessness, but it is important that you discontinue the medication as soon as you can. Using xanax for a prolonged period of time can send you into withdrawal that is as bad if not worse than opiate withdrawal. Read how to use Xanax for opiate withdrawal here. Hot baths/showers – Taking a hot tub when you’re dope sick can do wonders for your muscle aches and soreness. I used to open the drain every few minutes and add more hot water to keep the temperature up. It’s also a great way to pass time while you’re waiting for meds to kick in. Laying in a hot tub was one of the only times I got any sleep during my first few days of opiate withdrawal. Yoga – Many people have suggested doing yoga as a home remedy for opiate withdrawal. It can relieve restlessness and anxiety, and clear your head. I would suggest it if you can muscle up the energy to do some poses. Flexeril – This is a drug designed to help with muscle stiffness and it can also induce sleep. I never had much luck with using flexeril for opiate withdrawal, but if it helps you, that’s all that matters. Thomas recipe – This is an old classic that you might have heard of. It’s a combination of vitamins and benzos that can give you a structure to stick with. Honestly it can definitely help but there are better options. This is great if you can only use a few opiate withdrawal remedies, but like I said there are better ways to get through withdrawal. Read about the thomas recipe here. Let me be very real with you – I was a heroin addict for the better part of 5 years. I tried everything to stop, including a lot of the opiate withdrawal remedies listed above. During all my time of being sober, I have decided to put together a protocol to help you get off of opiates as quickly as possible I have compiled this information with the sole purpose of helping as many people as possible. Before you go on and try some of these opiate withdrawal remedies, read my guide first and you can edit it from there if needed. The following is a snippet of my two-phase method to quitting opiates. You will need imodium, and lots of it. You will be immediately stopping your opiate of choice, and switching to imodium, which believe it or not, is also a mild opiate. It also has a ridiculously long half-life, which makes it the perfect taper drug. You will transfer off of imodium, and onto an all-in-one opiate withdrawal remedies supplement. Day five: 8mg in the morning, 8mg at night. Day six: 4mg in the morning, 4mg at night. Day seven: 2mg three times a day. Day eight: Continue using each day until you feel better.